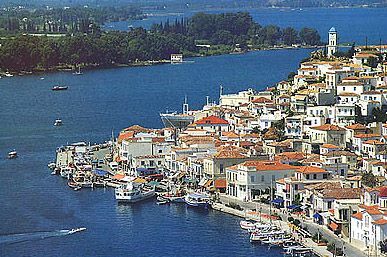 The island’s capital, Poros (pop. 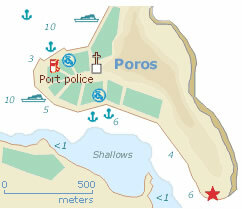 4300; naval training school), is beautifully situated on ancient Sphairia, a promontory of volcanic origin on the south side of the island linked with it by the narrow Bisti Isthmus. In the 18th and 19th c. this was the principal naval harbour on the south-east coast of Greece. 5 km north-east of the town are scanty remains of the Sanctuary of Poseidon (5th c. BCE), the centre of the Kalaurian amphictyony (religious league) of the maritime cities on the Saronic and Argolic gulfs. It was here that Demosthenes, fleeing from the henchmen of the Macedonian Governor Antipatros, poisoned himself in 322 BCE. The numerous remains of buildings in the surrounding area suggest that this was the site of ancient Kalaureia. 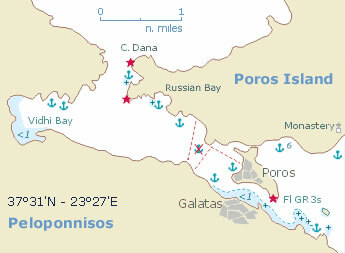 4 km east of Poros is the 18th c. Monastery of Zoodokhos Piyi. 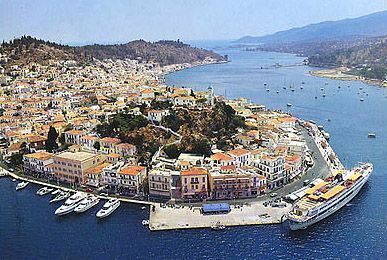 On the mainland opposite the island lies the huge lemon grove of Lemonodasos (30,000 trees), which belongs to Poros. 10 km west, at the village of Damalas, are the scanty remains of ancient Troizen, the setting of the legend of Hyppolytos and Phaidra.